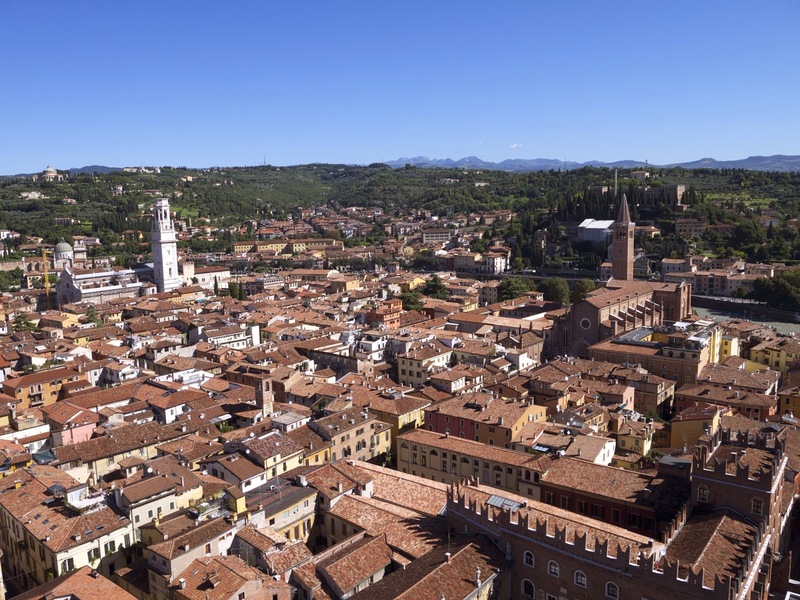 Verona's streets are a complete tangle; running around grand buildings and ancient stonework, overlapping, flowing, then snapping at right angles around an immovable church, little eddies of streets form courtyards without warning, run on and burst suddenly into a sunlight Piazza. 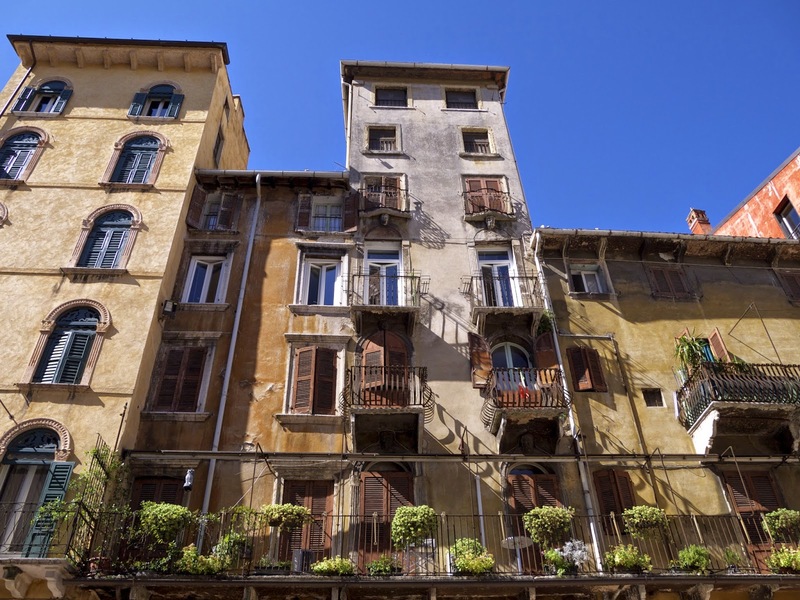 Everything in the city shows you its age, ancient monuments or careworn apartments with crumbling plaster, peeling paint and worn wooden doors. The occasional freshly painted building seems alien and film set fake in its newness. The whole city is textures asking to be touched. Rounded cobbles, smooth pebbles, rough brick, foot step polished marble, raised wooden knots, flaking paint and rotting plaster. Not a single join-less glass or steel structure in sight. Everything is well used, from the drooping wrought iron balconies to the rusty chain holding a faded whale's rib under an archway. Looking down on the terracotta roofs from Lamberti's clock tower the street pattern doesn't become any clearer, the narrow roads and overhanging tiles are just as jumbled from above. Most of the old town sits in a tight meander of the granite grey river Adige. To the south the landscape runs flat to the horizon, to the north the first low hills hide the Dolomites, and beyond them the Alps proper, from view. The tower springs from the old red brick and stone municipal building of the Palazzo della Ragione. A Gothic staircase climbs up two sides of the courtyard and leads to an art gallery. The most spectacular sight inside is the chapel of notaries, two small rooms with a gloriously painted ceiling of biblical scenes and carved wooden panel walls. The effect only slightly diminished by the constant and spooky mechanical whirr of two security cameras tracking you through the rooms, perhaps a modern reminder of the new testament pictures above you that someone is always watching. At the foot of the tower lies the Piazza della Erda, where last night the market stalls were folded up like sleeping tanks in their shells, each pinned in place by a closed umbrella. This morning they've blossomed open, alive and ready to sell brightly coloured fruit and trinkets to tourists, but it’s still early and relatively quiet. Only the occasional echoing sound of a rasping two stroke engine bounces through the streets as a scooter scurries past. A short distance from the Palazzo is 'Juliet's balcony', a 1930's invention that sits in a small courtyard. The dark archway into the courtyard is covered in writing; marks of love and hope, with some painful prayers mixed in. The walls are now so black with messages that people have continued with sticking plasters, making their love visible in rough black on beige scribbles. Below the balcony itself is a bronze statue of Juliet, with a queue of people waiting to have their photo taken, each climbing up with the help of her right arm and cupping her right breast for luck, leaving these two isolated spots brightly polished. Standing back near the gift shop to take in the scene it smells of stale mint and fruit, I turn to find that behind me the wall is a strange pointilist effect of old chewing gum, stuck to the old bricks, with occasional coin pressed into the mass it. The messages on the wall I can understand, but I don't see the romance in discarded gum. At the southern end of the city the arena is probably the single most spectacular building in Verona, dating from the first century and still a working venue today. It sits in the corner of a piazza, opposite are acres of awning covered restaurants, from under the shade of which tourists, like ourselves, gaze while eating over-priced pizza. The west side is ringed with the dismantled sets of countless operas; sphinxes, paper and plaster rocks, carts, chariots, columns and the gates to hell. A big yellow construction crane watches over them all, able to pick up any needed parts and hoist them into the arena and onto the stage. Inside you see the stone terraces, in some areas with metal seats placed on top, and try to imagine how many shows must have been performed here, the almost two thousand years to entertainment provided, from gladiatorial combat to pop concerts. It’s good that the arena, like all of Verona is still in use, and not isolated and put into a little bubble of its own, a museum piece separated from the flow of time by a velvet rope. 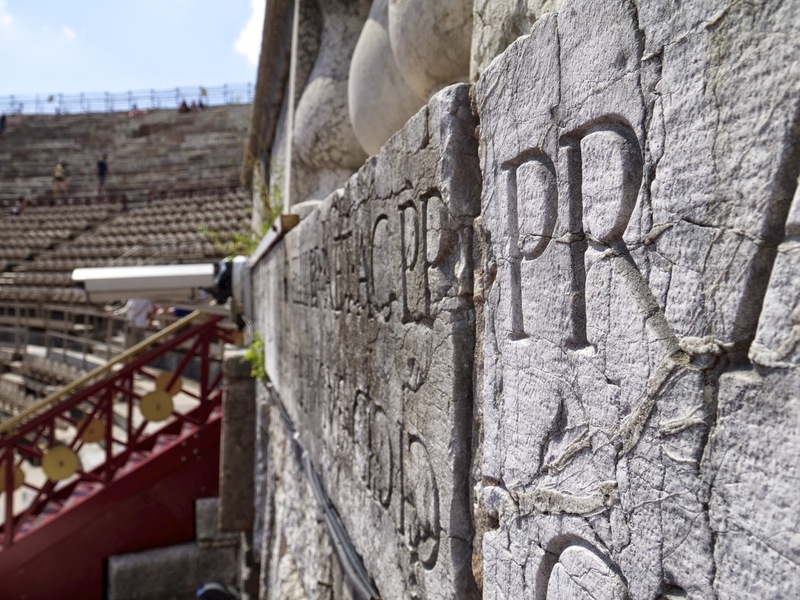 Sometimes though you wonder if it could be done with a little more tact; like the huge security camera bolted crudely onto the roman inscription above the main entrance of the arena and the scaffold around the edge to stop people falling off, but some of the charm is the careless way that the ancient is treated. It’s not a city if no-one lives here. There is a large and elaborate, if slightly faded, fresco painted onto the buildings on the east side of the Piazza della Erba, but below it on a rickety balcony sits a bored looking lady, chain smoking and reading a brick of a novel. Here the spectacular and the mundane are thrown together in a way that reminds you that it's not a theme park, but alive in all ways, even the ordinary ones.